Rev C Frank Phillips is the current pastor of St John Cantius Parish, which is a patron of sacred music. After receiving a Master of Divinity from St Louis University, Phillips was ordained as a priest and went on to each music history and theory at a high school for 11 years. 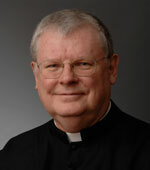 Since becoming pastor of St John Cantius Parish in 1988, Phillips has established Saint John Cantius as a parish renowned for its commitment to renewing the sacred liturgy and classical Church Music. Sacred Music Radio was fortunate to sit down with him and discuss community’s reaction to sacred music. How do you feel we can encourage spiritual and sacred music amongst the younger generations? I believe they first have to experience the music by hearing it. Recordings are a start, but the impact by hearing it in the context for which it was written has a lasting effect. You continue to promote sacred music at Saint John Cantius Parish, what drew you to becoming a Patron of Sacred Music? Simply put, it was my musical background. Using the sacred music at Mass and devotions comes from my acquaintance with Monsignor Hellriegel and Monsignor Schuler and from the studying of the Vatican II documents on the Sacred Liturgy as well as previous papal documents on Sacred Music. What work does your parish do to promote sacred music, not only within the church but also in the local community? We use brochures which list the times and renditions used along with the Internet and word of mouth. Do you think that music from spiritual traditions has a capacity to connect tradition and modern life? Without a doubt. Our young people are thirsting for this type of music, because it draws them into the mystery of what is being celebrated. How can one be a Mass listening to say the Creed of one of Mozart’s Masses and not be moved? Many people believe that sacred music helps build interfaith relations, how you think we can best achieve interfaith harmony? Many of our choral members and orchestra members are from different faiths. The music brings everyone together in a unique way. This is a different form of evangelization. In fact some members who either sang or played at St. John’s have become Catholic. Do you find it difficult bringing sacred music to your parish on a regular basis? The clergy play a big part in promoting good sacred music. The main obstacle we face is that the Church will have to learn to pay good musicians a good living wage. If you have volunteers for key positions, you may just get what volunteers can offer. What are your thoughts on the dogmatic approach to religion? Dogma invites one to delve into the mysteries of our faith. Without the solid dogmas, which the Church teaches, we may just have feelings-and feelings change. After having looked at Sacred Music Radio (http://sacredmusicradio.org ), and gained a better understanding of its aims, what direction would you like it to head? What would be a thought is to use the media for further education as well as invitations to learn more on the part of the listeners.